John Balistreri is not interested in making wines for you. It’s not ego. The Denver vintner is thrilled if you love his merlot, but he only creates wines the old-fashioned way, the way he did when he was a carnation grower who put away a barrel or two at home each year. Only handpicked grapes are used, nothing machine-harvested. He doesn’t buy pre-pressed juice. The grapes are fermented only by the yeast that’s on them or in the winery, not added to the juice. No sulfates are ever added to slow oxidation. Other steps are taken to reduce the wines’ exposure to oxygen. The wines are always unfiltered, John Balistreri said, to retain more of the subtle flavors. He won’t make a blended wine because he loves the distinctive character of a given varietal. The wines are either 100 percent Colorado grapes or 100 percent California grapes of a particular varietal. (Balistreri has a cousin who grows grapes in Lodi.) The bottles also note the specific vineyard where the grapes were grown. Finally, “I like very fruit-forward wines. For me to get that, I need older grapes, ones that stay on the vine longer,” he said, adding that while it’s not what he’s after but these wines also tend to have a slightly higher alcohol content. The result of doing things his way is a current roster of 18 or more individualistic wines, everything from a 2009 Colorado Viognier and a 2008 Late Harvest Merlot to a 2010 Colorado Sangiovese and a 2011 Colorado Riesling. For many years John and his daughter, Julie Balistreri, sold most of their wine out of a tiny tasting room and, in summer, an embowered and artsy outdoor seating area until finally building a new facility this year that includes a huge tasting room, event facility with a commercial kitchen and that cellar. Now they serve lunch seven days a week featuring food from Top Chef winner Hosea Rosenberg. “I forced him into it,” his daughter said smiling toward her dad. Long before this upgrade, Balistreri Vineyards was becoming a busy destination for tourists on their way to Denver International Airport. Julie Balistreri said that recent visitors have hailed from Texas, Minnesota, Illinois, Brazil and even France. The site is a pretty oasis in a, well, … let’s call it an unusual neighborhood for a winery in unincorporated Adams County north of Denver. Their close neighbors include a crane company, the Federal Fruit & Produce Company, and then there’s the power plant visible from the back of the building. But not so long ago, the area was the bustling home of Italian-American truck farmers who supplied Denver with produce and cut flowers. John Balistreri’s parents settled in the area in the 1940s. “My dad worked on the railroad. My mother’s side operated truck farms,” he said. The family was growing Colorado’s legendary Pascal celery in its greenhouses – that’s celery that’s grown without exposure to the sun so it’s cream-colored, an Italian favorite at Easter. Then the celery business crashed when a bug invaded so they turned to fresh-cut flowers until the 1990s when that business faded as South American growers took over. “We had to look for something else,” he said. John Balistreri tasted his first watered-down sip of wine when he was eight years old. Every year his uncle made some muscat wine – dry instead of the typically sweet version. “I helped with the crush, using the hand-cranked grape crusher,” he said, all the while learning the mechanics of winemaking. In 1998 J. Balistreri Winery produced 22 barrels and sold most at their flower stand at the Cherry Creek Farmers Market. In the summer of 2012 there are 270 barrels stacked in the new cellar with room for more. The very small crew will be bottling steadily to make room because the fall crush is coming quickly. A rare haul of late ripening tart cherries from Hotchkiss will be used in the winery’s sole non-grape variety. Recently, some cherry wine barrels were borrowed to age Stranahan’s Colorado Snowflake Maroon Bells Whiskey. Now, they’re back and infusing Port with some boozy nuances, while several Port barrels are now at Stranahan’s to enhance a new batch of Maroon Bells. Some Balistreri is available at liquor stores and a few eateries, but more than 90 percent of the winery’s production is sold at the winery. Among the most popular are the Little Feet vintages made from grapes kids crush with their feet at the winery’s annual fall Harvest Party, at Tagawa Gardens, and at the Italian Festival at Belmar, Julie Balistreri said. “At Belmar we do 1,000 pounds of grapes an hour for two days,” she said. Needless to say, parents and grandparents are eager purchasers. The winery is still a family business with three generations involved. John still makes pasta and sauce from scratch for family dinner every Sunday. And if life had gone differently, he would be growing carnations and zinnias. “And I’d still be making wine and drinking it,” he said. Before its large tasting room, event center and barrel cellar opened this year, Denver’s Balistreri Vineyards had a tiny tasting room and small patio with a tiny menu of wine-friendly dishes. “I just wanted a few great small plates to go with wine tasting but we ended up with a whole menu,” co-owner Julie Balistreri said. She went looking for a chef who was passionate about food and wine . She found one of Colorado’s best known chefs, Hosea Rosenberg. He won the fifth season of Bravo’s Top Chef series when he was executive chef at Jax Fish House in Boulder when he won. Now Rosenberg operates Blackbelly Catering company, partially out of this new kitchen, and operates a small farm but has no restaurant. 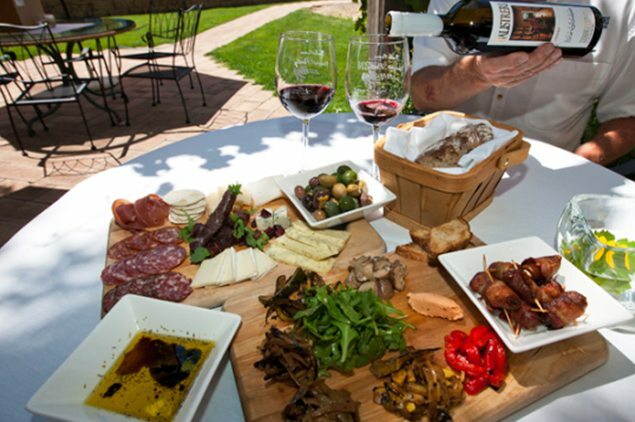 Rosenberg’s casual winery menu – served at lunch or brunch every day is a genuine, reasonably priced pleasure. The antipasti menu includes salumi, cheeses and marvelous grilled and marinated vegetables. Hot Italian sausage and peppers in wine-mustard sauce crowns a small plate roster including house-smoked trout salad. The house arugula salad is dressed in a tangy grilled lemon vinaigrette and sided with artisan ciabatta and dipping oil. It’s worth a summer visit just try Rosenberg’s stellar chilled tomato gazpacho with watermelon and mint, preferably with a San Daniel prosciutto and fontina panini. For dessert, kick back at an inside or patio table and sip a port or any of the 20 Balistreri wines available by the glass.